Tomatoes should be firm and juicy with bright, unblemished skin. Choose those that have a deep color and give a little when squeezed. And remember: a ripe tomato smells like a tomato; unripe ones have no aroma. Rinse tomatoes before using. Quick tip: To peel, drop into boiling water for one to two minutes. Then remove, dunk briefly in a bowl of ice water, and cut out a small cone around the stem end to slip off the skin. For a simple side, slice tomatoes, drizzle olive oil and balsamic vinegar over the top, and then season with a sprinkle of sea salt. 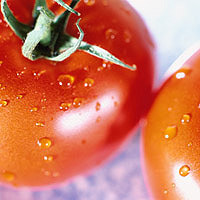 Tomatoes are an excellent source of vitamin C and a good source of vitamin A.